Public transit users in Montréal, Canada have benefitted from a regional integrated fare scheme since 1998. Monthly pass holders can get unlimited rides on commuter rail, metro, express and regular bus services provided by 16 public transit organizations. The integrated fare level is set according to the eight concentric zones radiating from the central business district and monthly pass holders can benefit from a fare rebate of up to 25% when compared to buying two separate passes. A well-established revenue sharing mechanism based on network use is also in place. In 2008, the region has implemented an interoperable smart card fare collection system that further strengthens the ties in fare matters among organizations. As the regional fare integration scheme does not replace the fare table of local jurisdictions, challenges remain in the current fare systems: inconsistencies from overlapping integrated fares and local fare structures; the wide array of fare products emerging from them; equity among flat-fare, zone-based and mode-based fare structures; and variations in fare rules and practice. As a continual effort on improving public transit services in the Montréal region, the Agence métropolitaine de transport (AMT), along with all the public transit organizations, have been working together in the past three years and have successfully completed a strategic reflection on the fare structure of public transit services and equipment in the Montréal region with the guidance of an external advisor. It was a comprehensive and collaborative process with the goals of improving the performance of the fare system and customer experience regarding fare purchase. The process identifies possible improvement to the exiting fare system and proposes a guideline for a complete makeover of the fare system. Starting with an analysis of the current situation and an international benchmarking, the participants agree on a common vision of a more user-friendly and coherent fare system at the regional level. The workgroup then comes up four promising scenarios spanning various levels of ambition: optimization of the current fare system, incremental evolution by simplifying the system and revolution involving a complete makeover. All the scenarios involve simplification such as reduction of the number of fare zones and a differentiation of transit modes in the fare structure. The main elements that differ among the scenarios are the presence or not of a unified fare structure, the geography of the fare zones and the modal division. Each scenario is evaluated quantitatively and qualitatively: a data-driven spreadsheet model is used to estimate change in fare revenue and ridership; concurrently, user benefits and complexity in implementation are identified. In parallel, the workgroup also evaluates, at a high level, the impact of some fare measures in adjacent scenarios: harmonizing fare categories and level of rebate; introducing peak and off-peak fare; replacing transfer-based single-trip ticket by time-based ticket , introducing integrated single-trip ticket and introducing park-and-ride fare. The process is unprecedented and rewarding. All the partners have devoted a significant amount of time and energy to this consensual effort. It brings together expertise from various organizations to address methodological and ideological issues. The highlights of the process include an agreement on the objectives of the future fare system; a comprehensive regional portrait on fare matters in a decentralized setting; an understanding of the dynamics governing the current situation; a common vision on the evolution of the fare system and the elements of its foundation; the formulation and evaluation of four promising scenarios and a comprehensive debate on the merits of each scenario among the participants. 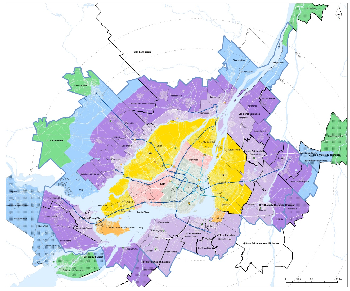 As the public transit in the Montréal region is transitioning towards a new governance model, the commitment shown by all the parties involved and the resulting deliverables provide a solid foundation on fare matters for the future regional transit authority. Its new role and responsibilities would facilitate the implementation of changes in the fare structure, practice and technology necessary to address the evolving needs in public transit and for the creation of collective value.